Average Weight	: 30-40 lbs. We identify and rescue brittanys in need in the state of Texas. 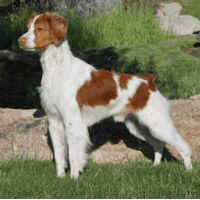 The Brittany was named for the French province of Brittany and may be the result of crossing the Orange and White Setter along with some not clearly identified French dogs. Since the Brittany looks a lot like the Welsh Springer Spaniel some think the two may be related. The breed is one of the most popular pointing breeds for bird hunting. The first records of Brittany-type dogs are visual: paintings and tapestries dating to the 17th century that show liver and white dogs pointing partridge. Modern Brittanys started to take shape in the mid-1800s in Pontou, a small town in Brittany. Rumor has it that they were the result of a cross between a white and mahogany female owned by a French hunter and a lemon and white male brought to Brittany for shooting by an English sportsman. Of the two pups they produced, one was considered to have the requisite hunting ability and became a popular stud in the area. The result was bob-tailed dogs that pointed and retrieved. Local poachers became quite fond of them for their speed, agility, and willingness to take direction. Around the same time, dog shows became popular in Britain and other parts of Europe, including France. Brittanys moved effortlessly from the field to the show ring and were recognized as a breed in France in 1907. The first French Brittany registered in that country was an orange and white dog named 'Boy'. Brittanys became recognized in the United States in 1931 and gained steadily in popularity. The first Brittany registered with the American Kennel Club was 'Edir du Mesnil' in 1934. The American Brittany Club was formed in 1942 and rewrote the French standard to suit themselves. Like so many breeds, Brittanys suffered a decline as a result of World War II. In France, breeding of Brittanys came to a halt during that time. After the war, French breeders decided to allow black spotted dogs in the standard because the gene pool was so depleted throughout Europe. U.S. breeders did not follow suit ~ even today, the color black is not an accepted color both in the U.S. and Canada, but it is accepted in all other countries. For many years, many breeders wanted to delete the word "spaniel" from the name of the breed because Brittanys are pointing dogs, not flushing dogs like spaniels. In April 1982, the AKC Board of Directors approved changing the name to Brittany, deleting the word "spaniel" as a part of the name. In some other countries, however, they still are called Brittany Spaniels. •	Happy, high energy, medium size ~ alert dogs. •	Curious and independent ~ but very willing to please their owners. •	Brittanys like to stay active. "Task Oriented" dogs. •	Brittanys will do well in dog sports such as Agility and Flyball. •	Very intelligent ~ they need lots of mental and physical stimulation. •	Need plenty of socialization as early as possible so they don't get bored and become 'chewers'. •	Not best suited to apartment life unless getting out and exercised a lot every day. •	Brittanys do well in cold, damp weather. •	Used to work with their Masters out in the fields to find and point ~ Brittanys do well in country settings with lots of wide open space. •	With their dense, flat/wavy coats make them easy to groom. •	Good with children ~ if properly introduced & children handle them properly. Brittany Spaniels are a highly intelligent and obedient dog due to their history as being developed as a hunting dog. Eager to please Brittanys have a very loving and gentle personality. However, they can be known for their highly independent nature and are free thinking spirit. Brittanys are consistently happy, enthusiastic, good natured and easy to care for. It must be noted however that the Brittany must be raised around children from puppyhood to be well mannered around them. Some are also known to be very nervous and hyperactive. Typically the Brittany has a very jolly personality and makes a very good companion dog. The Brittany is not a dog for everyone. They tend to become hyperactive and experience separation anxiety when left alone. This can make them destructive around the home. They also tend to whine and bark excessively when excited or stressed. They are very inquisitive and enjoy sniffing and therefore will follow their nose until they are completely out of sight. They are also known to show some fearfulness towards people when they are not properly socialized from a young age. The Brittany is also very sensitive to stressful situations. For instance, if people in the home are arguing or there are family troubles the Brittany will pick up on it and become very nervous. This is when the dog will become withdrawn and anxious and start to whine or bark. Brittany dogs deserve to be in a calm, harmonious, and loving home. They also exhibit a natural softness that can cause problems as well. It is important for the Brittany to be socialized at an early age so that the softness does not turn into fearfulness or shyness. Brittanies are also known to have dribbling and urination when they become overly anxious or excitable. It should be mentioned that the Brittany can have a range of personalities and therefore all the above temperament positives and negatives may or may not apply. Some can be very lovable and timid. These are the Brittanies that could never be used as a hunting or gun dog because they will react to loud noises. Others are very outgoing and playful and love to be around people. The Brittany's level of grooming can be noted as minimal or moderate. The medium length flat coat needs to be brushed on a regular basis to keep it in good condition. Brushing should be done twice weekly. The Brittany is light shedder. Regular bathing is necessary for the Brittany as well. The dog should be washed with a specialty dog shampoo. It is important to avoid using human shampoo or liquid soap because this causes skin irritation. Bathing should occur about once a month or whenever necessary. Over bathing can cause skin dryness. It is also important to rinse all the soap thoroughly to avoid skin irritation from the soap residue. Bathing the Brittany can be easily done at home in the bath tub due to its smaller stature. If the dog is being used for hunting or spends a lot of time out in the brush, it is important to check the ears thoroughly for matter or debris. The dog's love for water can cause them to get mucky or dirty faster and therefore bathing may be more frequent than with other breeds. In addition to this, it is extremely important for the dog to be checked over for ticks with particular attention to the eyes and ears. Professional grooming of the Brittany may be necessary if the dog is for show. There are very specific requirements for show ring grooming of the Brittany. Otherwise the Brittany is a very low maintenance dog for grooming. Brittany is a highly energetic dog and needs a high level of activity. It is essential that the dog gets daily activity consisting of running, walking, or biking. They also love to be in the water. They are the perfect pet for a very energetic person or family. They are also the perfect pet for a hunter who can have the dog for its working purpose. The Brittany adapts to different terrain consisting of hills, woods, or plains. This allows them to go on family outings or hikes and because of their endurance they can keep up easily. However, they are resistant to the cold and damp conditions. One of its favorite things to do is retrieve things from the water. This makes them an excellent dog to take to the lake on family outings. Their history as a gun and hunting dog and their love for the water makes them excellent fetching dogs. Fetching in water is a great way for the Brittany to get its exercise. Brittany Spaniels have softness about their nature and therefore it is important for the dog to be socialized at an early age to prevent fearfulness or shyness from developing. Puppies should be brought to new places and around new people from a very early age. This will allow them to become comfortable in new circumstances. If the dog is going to be kept in a kennel or cage when the owners are not home, it is important to train the dog from an early age to be quiet in the cage. The Brittany is prone to excessive barking and therefore this should be handled from a very young age. They are also a very excitable and rambunctious breed so it may be necessary as well to train them about having proper house manners. Get the dog used to knowing what is and is not acceptable behavior when it comes to jumping, barking, and chewing. They can become destructive when left alone for long periods of time so manners training can be very important. The Brittany's obedience training should be motivational and gentle. This breed responds best to love and they are eager to please so any training that is harsh or domineering is counter productive. Because the Brittany is a hunting and gun dog there are some specifics to training them for this purpose. There are several organizations that can professionally train the Brittany as a gun dog. There are also several books and articles that can help as well. However, more than likely if you are using the dog as a gun dog or hunting dog you have experience in the area and are capable of training the dog yourself. Professional help is always available when needed. However, it is important to note that Brittanies can have several different ranges of personality and some that are very timid and shy may react to loud noises and cannot be trained as a gun or hunting dog.